In recent years, we got new Instagram star from the animal kingdom with its generous and cute smile. 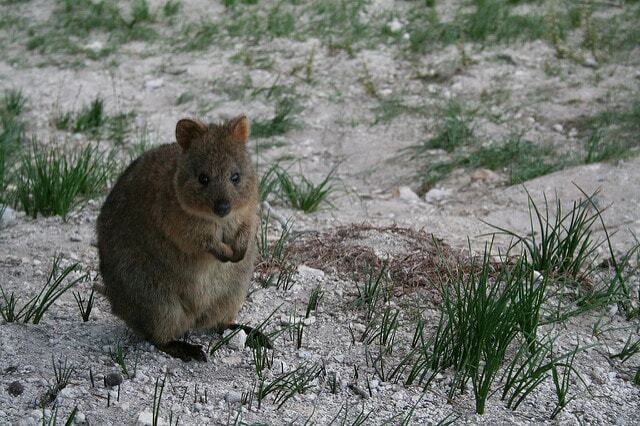 It is quokka, a small nocturnal and herbivore marsupial the size of a domestic cat. This Instagram star is considered as the happiest animal in the world. 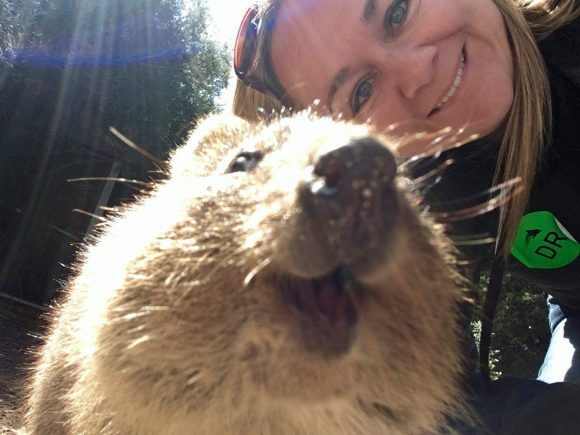 Like mentioned before, quokka has earned the title of Instagram star because of the generous and cute smiles it always shows in most picture of it. The vulnerable species, according to IUCN red list, somehow indeed has unique facial construction making them appear like always smiling animals. But are they really the happiest and kindest animal in the world? In this article we are going to talk about the only member of genus Setonix existing in the world, quokka. We might have known that dogs and cats are able to express happiness and other kinds of emotions. So, are the smiles that quokkas do also the same way they show the expression of happiness? You might want to think twice. First thing to notice is that quokkas are not stupid, like the long-held assumption that people had. Clive Wynne, a behavioral scientist from University of Western Australia, explained that this animal “have any magical cognitive abilities but they’re not stupid”. “They have the skills they need—honed by evolution over millions of years—to thrive in their natural environment,” said Wynne. The researcher said that thing to emphasize that quokkas’ smile is not the “dumb smile” we see when we give our dogs a pizza slice, but it is something different. The smile they show on our Instagram feeds is a kind of “badass” smile, because they possibly know that they are loved for doing so around human. But human kinds do not give significant benefits to the species in their survival in the wild, and that’s another thing to consider. The only explanation that Wynne can give about the innocent and pure smile they show in the photos is that somehow an accident took place in their natural evolution phase. “It is an accident in evolution,” said Wynne as quoted from Mentalfloss. Isn’t an ‘accident’ is too much to describe it? Maybe not. In fact, they are not the nicest animal in the world. They are more likely cute tiny furballs with tenacious and badass characteristics, more like Rocket in Guardians of the Galaxy than Winnie the Pooh. Yep, that’s quite the right word to define the characteristics of this animal. Unlike pandas that seem nice to the bottom of their hearts, quokkas are not. Quokkas might seem cute, tiny, and happy, but behind those smiles they are quite tenacious creatures. The big feet of quokkas are equipped with sharp claws that can hurt you to the bone if you give them a chance to do it. Kenneth Cook, an Australian journalist who tried to befriend the creature has been one of their victims. “Small, mean mouth. It was a malicious-looking beast,” Cook wrote in his 1987 book Wombat Revenge to describe this animal. None in the sentence was a strong word if it is based on the Cook’s experience that he wrote in detail in his book. 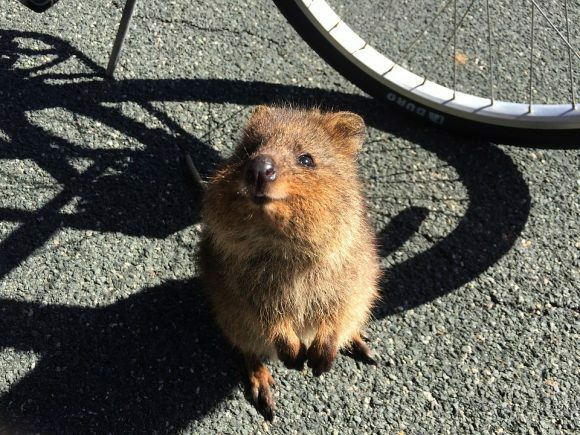 His experience started when he found a quokka when he biked along a dirt road in Australia. Cook tried to befriend the furry animal by giving it foods. First, cook tried to give it a slice of apple which it spitted out in disgust. Realizing the animal didn’t like the fruit, he tried to give it a crumb of Gorgonzola cheese. The animal ate it but then “fell down in dead faint”. He thought that he had poisoned the animal and tried to took care of it by taking it into his backpack and tried to bring it to the nearest vet. This is where the drama turned into a thriller. You might think it is funny, but what happened to Cook might sound out of your minds. In the backpack, the ‘poisoned’ quokka revived from its faint and climbed up with its claws out of Cook’s backpack. After that, the quokka started to grab his neck and began shrieking in his ear. The quokka then sank its sharp teeth into one of Cook’s ear and hung into it dead weight. He described this condition as like he is having a furry earring. Cook decided to stop his bike and that’s when the animal ran away from him. Feeling disoriented, Cook looked around and found the quokka from afar starred at him with a dead glare. 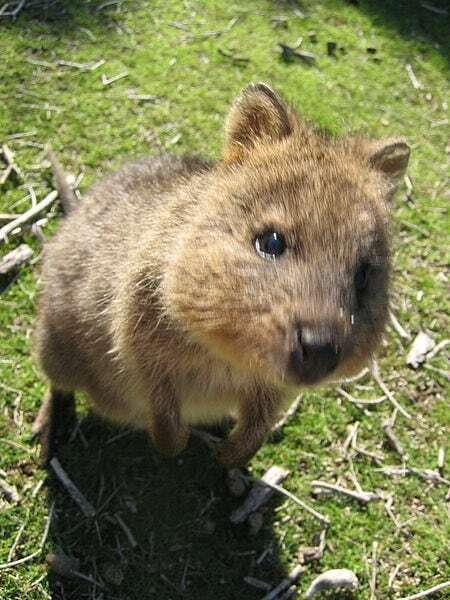 You might find this story impossible, but in fact each year dozens of patients are reporting quokka attack to Rottnest Island infirmary. However, such behaviors are just the animal’s defense mechanism. Among themselves, quokkas are known to be peaceful group of animals. The only thing they are fighting for is maybe a nice shady napping spot. That’s not the only badass thing about quokka. They are also known for other badass behaviors, such as stealing foods from nearby residences. “They wander down the streets and into cafes and restaurants,” said Senior Constable Michael Wear as quoted from Daily Telegraph. They are also reportedly stalked people who try to get closer to them. “I heard footsteps approaching, a little head poked out from behind a bush,” said Matt Hayward, conservationist from Bangor University when telling about his experience tracking a female quokka trough the bush at night. Quokkas are also known to willingly sacrifice their kids for survival. When being threatened by larger animals, instead of protecting the young ones they just run away faster than the little quokkas, leaving them behind as decoy. Even mother quokkas are reportedly throw away the baby inside their pockets and run away in order to do it. You might think it is a stone-cold strategy of survival, but it always works. While the mother just innocently makes another baby to replace her lost baby. So, do you still think that this animal is as cute as it appears? Well, think twice. You’d better prepare for a badass moment when you see one though.